There has been such a lot of interest in the just-announced Samsung Galaxy Note 3 that we’ve only just got round to detailing the new Samsung Galaxy Note 10.1 tablet. The Galaxy Note 10.1 2014 has also become official and we have some information about the device ahead. The new Samsung Galaxy Note 10.1 will release this quarter (despite its 2014 name tag) and the design features the same faux-leather reverse of the Note 3 smartphone. The new Note 10.1 still has a 10.1-inch display (so no surprise there) but resolution has been increased over the original Note 10.1, as it is now 2560 x 1600 and 299 ppi. Other specs for the new Note 10.1 include a 1.9GHz Exynos Octa- core processor (or the LTE version has 2.3GHz), 3GB of RAM and 16, 32 or 64GB of internal storage, with expandable storage via microSD. There’s an 8-megapixel rear camera, 2-megapixel front-facing camera, and an 8220 mAh battery. Dimensions of the Galaxy Note 10.1 2014 are 243.1mm x 171.4mm x 7.9mm and it weighs in at 535g. The bezels of the device are much slimmer on the new Note 10.1, which allows for an overall reduction in size. The tablet will launch on Android 4.3 Jelly Bean ahead of the release of Android 4.4 KitKat. A nice incentive for new Note 10.1 buyers is that the device will receive free Samsung Content Gifts from sources such as the New York Times, Bloomberg, Autodesk Sketchbook for Galaxy, and more. Another move that will be widely appreciated by existing Note 10.1 users is that the Twitter app has been redesigned for the 10.1-inch tablet format. Three varieties of Galaxy Note 10.1 2014 will be available, WiFi-only, WiFi and 3G, and WiFi and LTE, and on launch it will be available in black or white color options. Samsung hasn’t announced pricing yet or a specific release date, but we’ll pass on more news as we hear it. 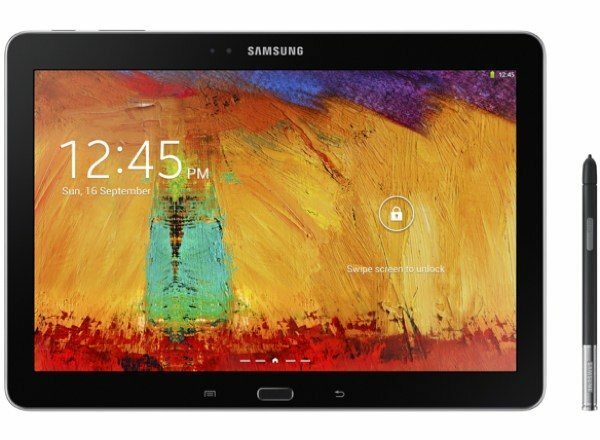 Are you a potential customer for the Galaxy Note 10.1 2014? Maybe you’ll upgrade from the original Galaxy Note 10.1 to the new Galaxy Note 10.1?